Hollow, for 1" O.D. tubing. Chrome plated bronze. Base: 2-1/2"Fastener: #8Fits: End PostHeight: 3-3/.. Formed 304 stainless steel. 2" Rail height. Size: 24"Color: Stainless SteelTube: 3/4" OD..
Carded. *Flagpole mounting hole is designed to fit 1/2" diameter flagpole. Angle: N/ADescription: 3-..
316 Stainless Steel Base: 1-7/8" x 3-3/16"Fastener: 1/4" FHAngle: Tube: 1" OD..
316 Stainless Steel Base: 1-3/4" x 2-5/8"Fastener: #10 FHAngle: Tube: 7/8" OD.. Cast 316 stainless steel. Carded. Base: 2-3/4"Fastener: 1/4" FHAngle: Tube: 1" OD..
316 Stainless Steel Base: 3-1/4" x 1-7/8"Fastener: 1/4" FHAngle: Tube: 1" OD..
316 Stainless Steel Base: 3" x 1-11/16"Fastener: #10 FHAngle: Tube: 7/8" OD.. Cast 316 stainless steel. Carded. Base: 2-3/4" ODFastener: 1/4"Angle: Tube: 1" OD..
Investment cast 316 stainless steel. Fastener: 1/4" FHTube: 1" ODDescription: Rail Height: 1-7/8"..
Investment cast 316 stainless steel. Fastener: 1/4Tube: 1" ODDescription: Rail Height: 1-7/8"..
316 Stainless Steel Base: 1-3/4" x 3-1/16"Fastener: #10 FHAngle: Tube: 7/8" OD..
Carded. *Flagpole mounting hole is designed to fit 1/2" diameter flagpole. Angle: Description: Unive..
Die-cast zinc, chrome plated. Base: 1-5/8" x 2-3/4"Fastener: #10 FHAngle: Tube: 7/8"..
316 Stainless Steel Base: 1-7/8" x 3-1/4"Fastener: 1/4" FHAngle: Tube: 1" OD..
Die-cast zamak with Perma-Plate finish. Angle: Description: Left HandTube: 7/8" OD..
Die-cast zamak with Perma-Plate finish. Angle: Description: Right HandTube: 7/8" OD.. Cast 316 stainless steel. Carded. Base: 2-5/8"Fastener: #10 FHAngle: Tube: 7/8" OD..
Carded. *Flagpole mounting hole is designed to fit 1/2" diameter flagpole. Angle: Description: Elbow..
Die-cast zamak with Perma-Plate finish. Angle: Description: ElbowTube: 7/8" OD..
316 Stainless Steel Base: 1-11/16" x 3"Fastener: #10 FHAngle: Tube: 7/8" OD..
Die-cast zamak with Perma-Plate finish. 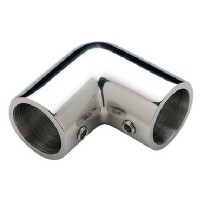 Angle: Description: TeeTube: 7/8" OD.. Blend bas 5 1/2 deg. w/set scw Fastener: Type: 7/8" ODTube: Rail Height: ..
Carded. *Flagpole mounting hole is designed to fit 1/2" diameter flagpole. Angle: Description: Bow F..
Bullet end plug chr plate 7/8 Fastener: Bullet EndType: 7/8" ODTube: Rail Height: ..
Investment cast 316 stainless steel. Fastener: #10 FHTube: 7/8" ODDescription: Rail Height: 1-13/16"..
Die-cast zamak with Perma-Plate finish. 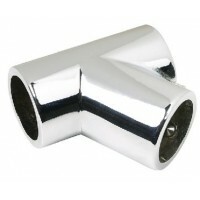 Angle: Description: Bow FormTube: 7/8" OD..
Die-cast zinc, chrome plated. Base: 1-5/8" x 2-3/4"Fastener: #10 FHAngle: Tube: 7/8" OD..
Investment cast 316 stainless steel. Fastener: n/aTube: 7/8" ODDescription: Bullet EndRail Height: n.. Formed 304 stainless steel. 2" Rail height. 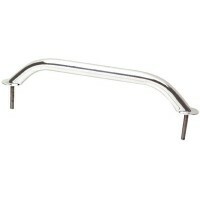 Size: 18"Color: Stainless SteelTube: 3/4" OD.. Formed 304 stainless steel. 2" Rail height. Size: 12"Color: Stainless SteelTube: 3/4" OD..
Die-cast Zinc Chrome plated. Fastener: #10 FHType: Left HandTube: 7/8" ODRail Height: 2-1/8"..
Die-cast Zinc Chrome plated. Fastener: #10 FHType: CenterTube: 7/8" ODRail Height: 2-1/8"..
Die-cast Zinc Chrome plated. Fastener: #10 FHType: Right HandTube: 7/8" ODRail Height: 2-1/8".. Cast 316 stainless steel. Carded. Base: 2-5/8" ODFastener: #10Angle: Tube: 7/8" OD..
Die-cast zamak with Perma-Plate finish. The base is predrilled. Base: 7/8"Fastener: #10 FHAngle: Tub..
Die-cast zamak with Perma-Plate finish. The base is predrilled. Base: 2-5/8"Fastener: #10 FHAngle: T..
1/4"-28 x 3/16" cone point hex drive. Card: 10.. Formed 304 stainless steel. 5/16" FH fastener. A: 12-1/4"B: 11-3/16"C: 2-3/8"Tube O.D. : 1".. Formed 304 stainless steel. 5/16" FH fastener. A: 18-1/4"B: 17-3/16"C: 2-3/8"Tube O.D. : 1".. Formed 304 stainless steel. 5/16" FH fastener. A: 24-1/4"B: 23-3/16"C: 2-3/8"Tube O.D. : 1"..
Carded. *Flagpole mounting hole is designed to fit 1/2" diameter flagpole. Angle: Description: Left ..
Carded. *Flagpole mounting hole is designed to fit 1/2" diameter flagpole. Angle: Description: Right..
12 ss stud mounted hand rail Stud: 5/16" x 1-7/8"Size: 12" (Stud Center-to-Center) x 2" H..
18 ss stud mounted hand rail Stud: 5/16" x 1-7/8"Size: 18" (Stud Center-to-Center) x 2" H..
24 ss stud mounted hand rail Stud: 5/16" x 1-7/8"Size: 24" (Stud Center-to-Center) x 2" H..
90 deg elbow-7/8 -ss Fastener: 1/4"-28Angle: Tube: 7/8" ODMaterial: Cast 316 SS..
60 deg univ. 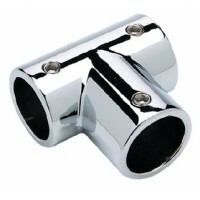 tee-7/8 o.d.-cpz Angle: Tube: 7/8" ODMaterial: Chrome Plated Zamak..
90 deg universal tee-7/8 -cpz Angle: Tube: 7/8" ODMaterial: Chrome Plated Zamak..